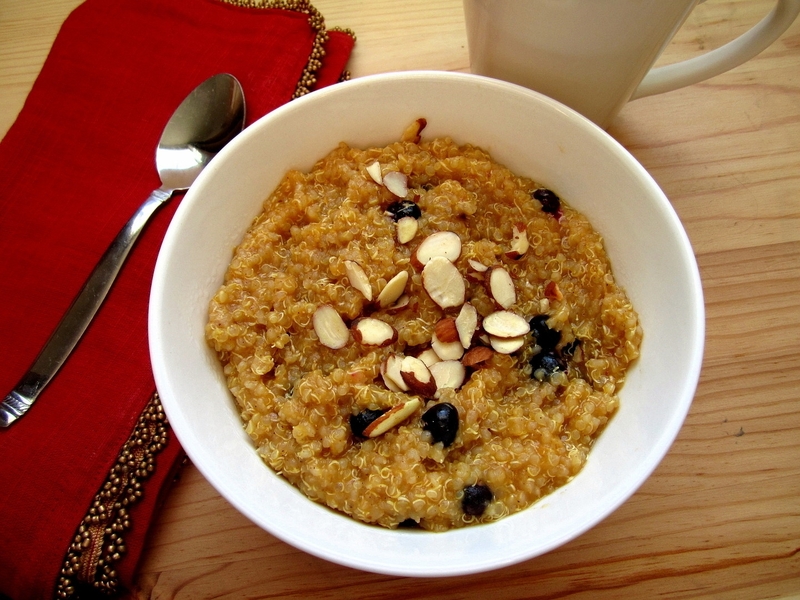 Pumpkin Breakfast Quinoa - Eat. Drink. Love. Alrighty friends, I have yet another quinoa recipe for you! I made this last month, but I figure that after tomorrow, you all will be over your pumpkin-cravings. So, if you are looking for some new ways to use up that pumpkin puree, here you go! 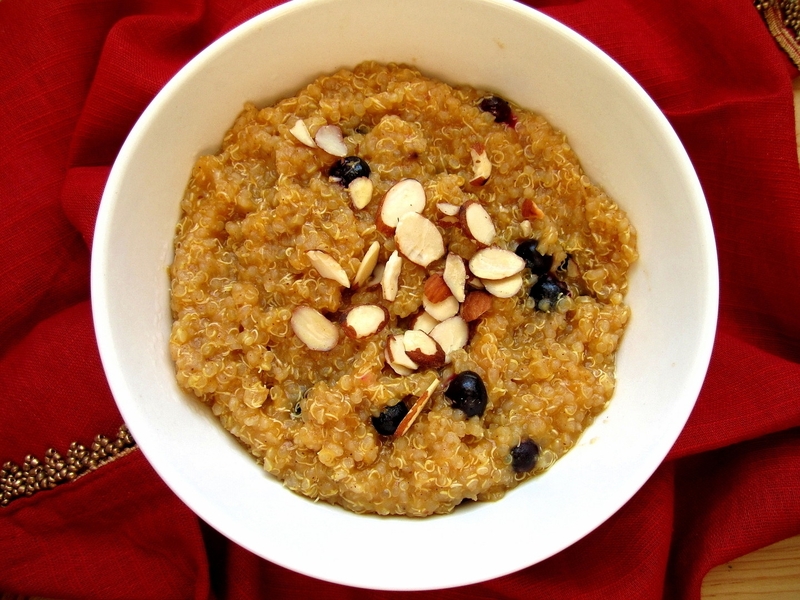 This breakfast quinoa is just as filling as oatmeal and tastes like fall in a bowl! I topped mine with almonds and blueberries, but dried cranberries would have been better if I had them. Also, I wanted to take this opportunity to wish you all a very Happy Thanksgiving! I am so thankful for each and every one of you that continues to read my blog! 1. In a saucepan, add the water, milk, and quinoa. Simmer for about 10-15 minutes until the quinoa is cooked and the liquid is absorbed. Stir in all of the remaining ingredients and serve! – You can adjust the sugar in this recipe to meet your own tastes. You can swap out the brown sugar for Splenda or Stevia if you want to make this sugar-free. You can also add more or less of the brown sugar. It’s really up to you! Yum! Everyone must be ready for Thanksgiving – I made almost the exact same thing this morning except with oatmeal and I baked mine. That looks yummy and healthy, a great way to work some fiber and fruit into breakfast. happy happy Thanksgiving to you! Pumpkin is going to stay on my list right through Christmas. Keep the recipes coming. Oh, that looks SO delicious! I am really enjoying having quinoa, but it kills me that I can’t add cinnamon to it…I think it would be the perfect spice! …and you proved it! What a beautiful, warming dish! Happy Thanksgiving! That really does stink, Ann. I think this would still be good if you just used nutmeg, ground cloves, and some ginger. What about cardamom? What a nice healthy change to some oatmeal! Love this and I am bookmarking this for later. Sounds delicious! I personally within the last year have discovered Quinoa and love how versatile it is. In fact I just made some Quinoa Buttermilk Biscuits to have for dinner tonight. Yum! When I hiked the Appalachian Trail last year with my husband, we first started hearing about Quinoa and now are very into making a variety of meals with it. thanks for this new idea! I hope you had a happy Thanksgiving! This looks soo good! I like the idea of craisins on top too. Have a great weekend! Breakfast quinoa – oh my! What a great and tasty way to have a protein breakfast without the meat! Looks so very good! This recipe would be so perfect for me because I go absolutely nuts for quinoa, AND I’m on a pumpkin craze. What a great way to use up the leftover pumpkin puree in my fridge. Oh yum! I’ve been eating almost exactly this (but with rolled oats) for breakfast the last few months. Will definitely need to try with quinoa, thanks for the tip! This sounds like a lovely fall breakfast Stephanie! Hope you and your family had a great Thanksgiving! I haven’t had quinoa for breakfast in a while and I am not sure why. It’s such a hearty breakfast. Love it with pumpkin – I might have to whip up a batch of this for the morning! This looks good and healthy. Hope you had a lovely Thanksgiving. I will never get enough pumpkin! I’m stocking up so I can make all these great pumpkin recipes throughout the year. What a fantastic breakfast! I hope you had a wonderful Thanksgiving Stephanie! I’ve made pumpkin quinoa too (actually turne dit into a parfait with Greek yogurt) and I love it. Next time I will definitely try it with cranberries! Now this would get me eating breakfast. Thanks so much for this one. Truly gorgeous. Wow, this looks really good. Thanks for sharing this yummy AND healthy recipe. What a great idea, and healthy breakfast! This is a great new idea, I am always looking for new recipes with Quinoa, and with pumpkin-a plus!